How common is it for new parents to put down roots in the same areas that they themselves were born? The answer, according to a new Pew Research analysis, depends on which part of the country they hail from. New moms who were born in the South are the most likely to nest in the same state their parents did. Texas tops the list — in 2010, 80% of moms who were born in Texas also gave birth in The Lone Star State. In fact, 7 of the 11 states with the highest share of “stayers” are in the South. Moms born in four Midwestern states along the Rust Belt — Wisconsin (73%), Ohio (73%), Indiana (72%) and Michigan (72%) – are also in the top 11 states. At the other end of the spectrum, new moms who were born in Wyoming are most likely to give birth elsewhere — only 41% of native Wyomingites have their baby in that state. Women born in the nearby states of North Dakota (49%), Nevada (53%), Montana (55%), Idaho (55%) and South Dakota (57%) are also relatively unlikely to stay put for the birth of their own child. In many New England states — New Hampshire (51%), Rhode Island (55%) and Vermont (57%) — the same is true. Moms born in Hawaii or Alaska are also relatively unlikely to be living in their birth state when they themselves settle down — less than six-in-ten are. A new Pew Research Center analysis using data from the National Center for Health Statistics and the U.S. Census Bureau finds that American women, by and large, stay put — about two-thirds of new mothers give birth in the same state in which they themselves were born. While it is difficult to pinpoint the reasons for this U.S. phenomenon, the likelihood of a new mother setting down roots where her own mother did is linked to her own characteristics, such as level of education, as well as the characteristics of her birth state, such as population size. In general, where people settle is influenced by a variety of factors, including economic opportunities, proximity to family members and other life events. According to new survey data from the Pew Research Center, seven-in-ten adults indicate that being near extended family would be an important factor to them in deciding where to live. Economic factors no doubt play an important role, as well. An earlier survey we conducted during the recession found that well over half of respondents either moved to a new location or stayed in their home community because of the economic and job opportunities. The more education a person has, the more geographically mobile he or she is, and the same is true among new moms. Those with less than a high school diploma are most likely to be living in the state where they were born — 76% are. For moms with a high school diploma, that number drops to about 71%. Mothers with a bachelor’s degree or more are far less likely to stay put — just 58% have their baby in the state in which they were born. Even among only highly educated moms, though, there are variations in the likelihood of nesting where their own moms did; for the most part, these patterns resemble the overall regional patterns with the South as the standout area where moms stay put. Fully 89% of college graduates from South Carolina who were new moms had their baby in the Palmetto State. And more than 80% of college-educated moms from Alabama, Texas, Georgia, North Carolina and Kentucky had their own babies in the same state that they were born. And as was the case among all new moms, college-educated moms who were born in parts of the Mountain West or New England are less likely to settle down in the same state that their parents did. Less than half of college-educated moms born in Maine, Vermont, Wyoming and North Dakota had their own babies in those same states. The likelihood of new moms putting down roots where their own moms did so is also associated with race and ethnicity. Black and Hispanic moms are the most likely to nest in the same state that their parents did — 77% of Hispanics and 76% of blacks do so. In comparison, just 65% of white women who gave birth in 2010, did so in the same state that their own moms did. Regional patterns of settlement are also linked to race and ethnicity. Among white moms, those born along the “Rust Belt” are particularly likely to nest in the same state that their own parents did, as are those born in Kentucky, Alabama, Texas and North Carolina. Among blacks, those born in the South are by far the most likely to have their own babies in the same state that their mothers did. 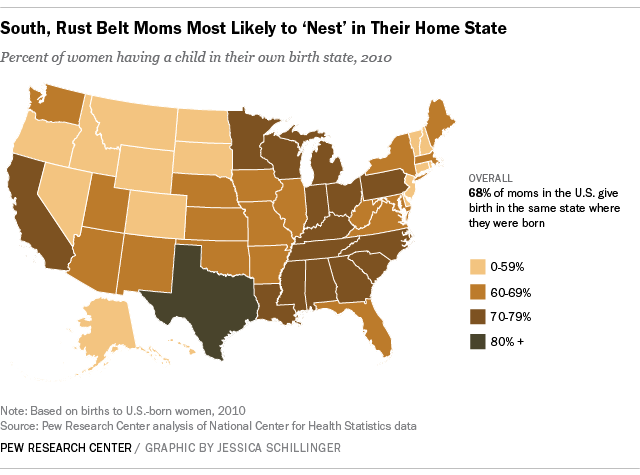 As with blacks, Hispanic moms born in Texas are particularly likely to nest there, but the likelihood of “staying put” is also very high for Hispanic moms born in the Southwest. Interestingly, relatively few Hispanic moms who hail from the South have their own children in their home states — a sharp contrast to the patterns among their non-Hispanic counterparts. So what factors are driving these variations in which states retain the next generation of new moms? It’s hard to know for sure. What we do know, though, is that there are a number of factors that are closely linked to the likelihood that a new mom will nest in the same state in which her mom did. One important factor is poverty — new moms from states with high levels of poverty are more likely to stay in those states to have their own children. While this data alone cannot explain this relationship, it’s reasonable to suspect that the price of moving may prevent those of limited financial means from moving. 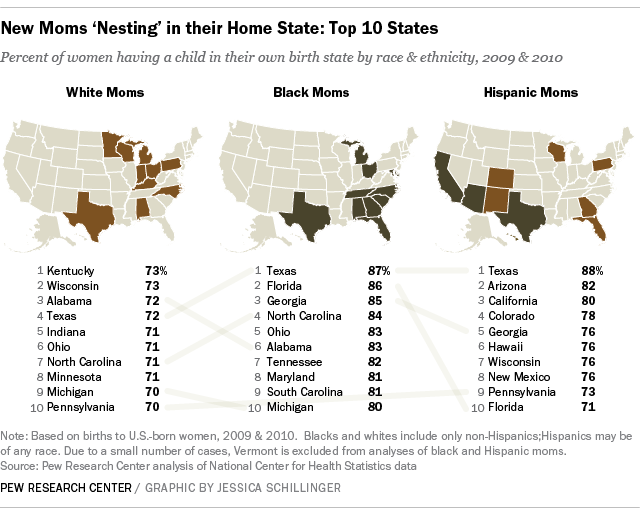 The educational and racial and ethnic makeup of the new moms from each state may also be playing a small role. Those states that produce more college-educated moms tend to retain fewer moms for another generation, while states with less-educated moms are more likely to retain new moms. The same holds true when it comes to race and ethnicity — states with higher shares of Hispanic and Black moms, who tend to be less geographically mobile, retain a higher share of their native daughters than states with higher shares of white moms. A state’s population size also comes into the mix. States with bigger populations (like Texas, with a population greater than 25 million) are more likely to retain the subsequent generation of new moms than are less populous states (like Wyoming, with a population of less than 600,000). Another possibility is that perhaps new moms are more likely to nest in their birth state, if that state has experienced lots of population growth — as has been the case with many states in the South. However, there does not appear to be a strong link between these factors.